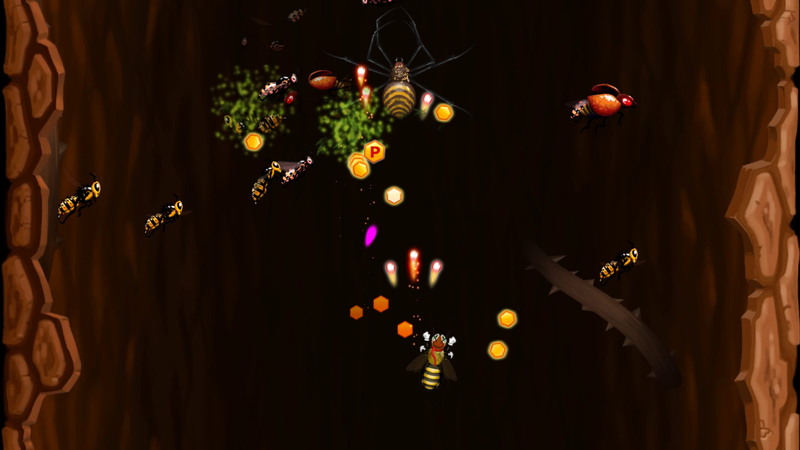 Beekyr Reloaded is a fun arcade-style action shoot’em up, that begs to be played over and over again. It is as unforgiving and unrelenting as it is pure unadulterated fun. Having been raised in a Nintendo home, I have played and bought the original Gradius multiple times over. 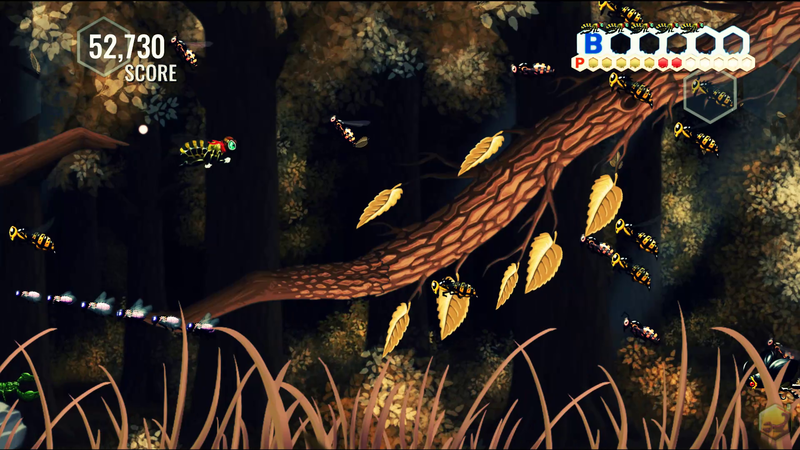 It was great getting back into the genre through Beekyr Reloaded, bringing back cherished childhood memories. 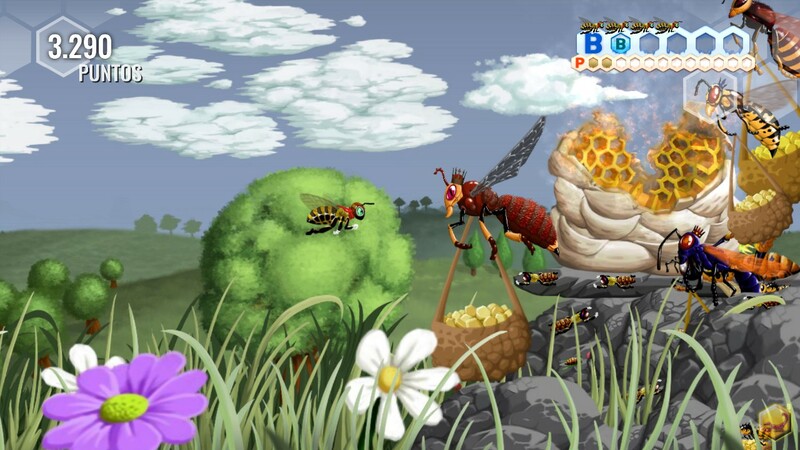 The game revolves around Beekyr, a hearty fellow who has to avenge his hive after their honey and pollen got stolen, fighting wasps, scorpions, praying mantises, frogs, beetles, and all sorts of enemies trying to prevent him taking revenge whilst journeying through all five interconnected worlds. The levels are short and snappy and the alternation of horizontal and vertical levels is a welcome feat which breaks up the monotony. Collecting pollen feels rewarding and keeps the player on its toes. 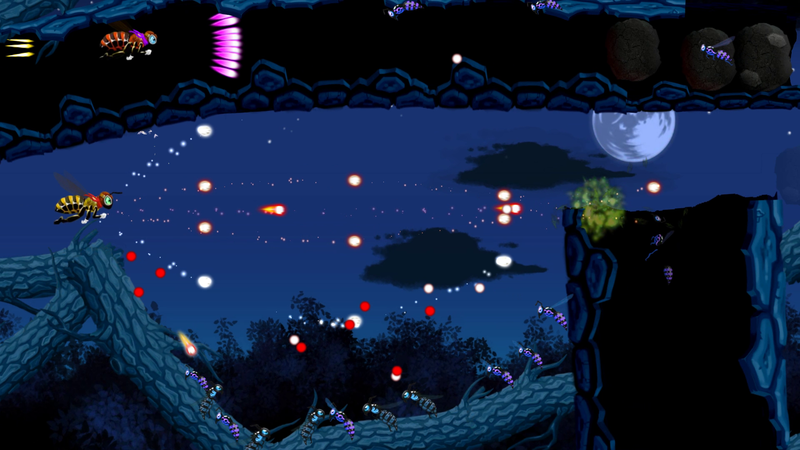 While the horizontal levels are focused on reaching the end of the level, all the while gunning down enemies, rocks, and incoming bullets, collecting bonus items, and picking up power-ups, the vertical levels in contrast are a reminder of Space Invaders, and are solely based on collecting pollen as it comes down. The power-up system works like a charm by means of simple stacking. Gunning around at high speed during an escape level and firing on all cylinders, having reached the maximum power-up is an absolute thrill. With three selectable characters the game adds something for everyone. The character sprites are nicely animated in their own right, and especially the second character looks great, jumping off of its cloud after being hit, only to land back on it and continue its killing-spree. Co-op mode is where the game really shines, and the nature of the Nintendo Switch is utilized to the fullest. No friendly-fire or bumping into each-other. Whilst being competitive, the game pushes you on to gun your way through the action-packed levels cooperatively. Unfortunately, only one character model can be selected, distinguishable only by their color difference; it would have been more interesting seeing the different characters playing side by side. From an easy-going exploration through natural settings, to wreaking havoc in the chaos of spray bullets, this game is for everyone, from first time shooters, till the very masters of this genre. Although the game plays very well loading times seem to be a tad long. The controls are smooth though slightly over-sensitive which can make the difference between a hit or miss. The choice to use the x-button for launching bombs feels a bit off as the b-button would have been more convenient. The game makes good use of the HD Rumble feature intensifying the overall game experience. 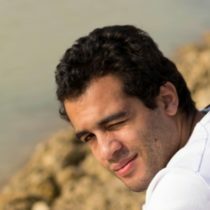 Beekyr is a one-shot-one-kill game, and when the life counter reaches zero there is no continue or extra coin to be inserted– although 1-ups can be earned. After allowing the player to submit a three-digit name to fill up the leader boards, the player is thrown back to the main menu to choose their hero once more and fly out again. 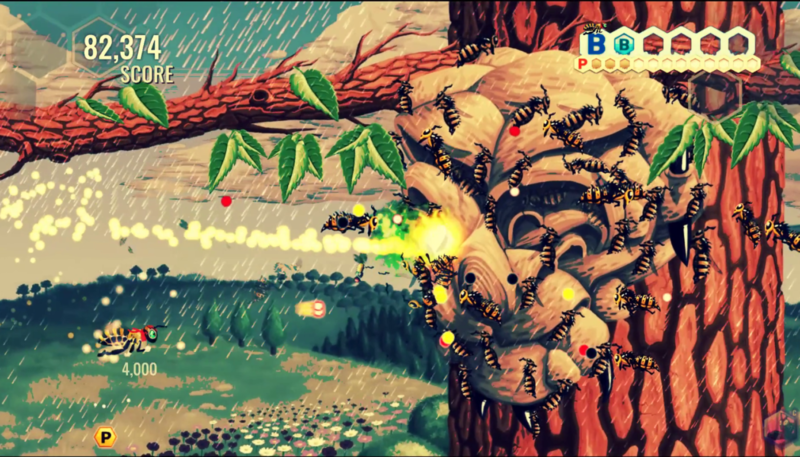 Beekyr Reloaded won’t blow you out of the water visually, but it is a good-looking game nonetheless, which plays without any frame-drops, being it handheld or docked. 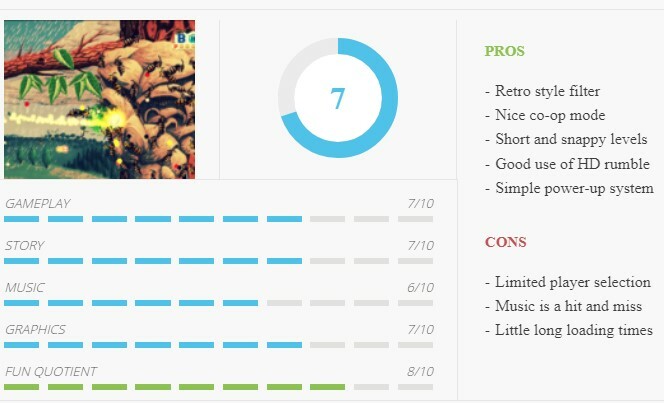 The levels look good and flirt with games of yesteryear, with its slightly desaturated color scheme. I found myself enjoying watching the full-screen backgrounds slide by as I flew through the levels. Adding the Lomo style retro filter really brought the game home. The user interface is clean and unobtrusive, with a personalized life counter depending in the character. The sound effects hark back to the earliest days of home console gaming with their clear-cut chip tunes and general feel to them. The music is a hit and miss though, as some tracks feel fit for the kind of level and gameplay, while others feel out of place and a missed opportunity. Beekyr Reloaded for the Nintendo Switch is a blast for the inexperienced and veteran alike. It’s quick, snappy, to the point, runs great, and the co-op ensures a healthy dose of competition. Is it something for you? If you haven’t had your fill of shoot’em ups yet and are hungry for more, or do you have that nostalgic itch, then this game is definitely for you. Beekyr Reloaded makes for a great addition to any Nintendo Switch owner’s library.